Sign up today for a non-expiring, risk-free, cost-free account for up to 10 learners. Thank you. Thinking Cap elves are getting you set up. If you would like to get a tour ahead of your trial click here to request a personal demonstration. Define as many learner gateways as you need for different user domains, each with their own branding. Create an experience that fits your business with your own brand-approved logos, colours, and fonts. Specify details at the domain level with unique custom fields, courses, locations, and certificates. Add as many nearly-independent learning management systems as you need, all in one domain tree (perfect for associations). Deliver SCORM 2004 and 1.2 courses, instructor-led training assessments, and learning paths. 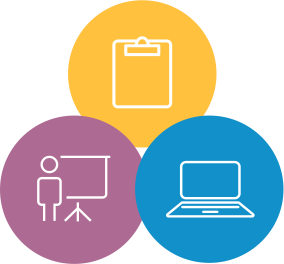 Support on-site, instructor-led training or online training through WebEx, Adobe Connect, or ON24. Include social participation, assignments, and feedback requirements in your course for a full virtual learning experience. Integrate Thinking Cap easily into your existing systems. Create automated login for your users through SAML 2.0, OpenID, oAuth, or custom-based single-sign-on options. Create any of 12 different types of reports, including course reports, user reports, and system status reports. Customize each report with built-in filters and your own metadata. Schedule recurring reports for automatic delivery to your list of recipients. Generate reports easily on-screen, in-print, or as exported XML. 90% of our Thinking Cap clients have been with us for more than five years. We have been with Thinking Cap for 10 years. The creativity of Thinking Cap staff and their ability to adapt their Learning Management System to mobile technologies has helped keep our learning program, Welcome to Parenting, fresh and appealing. Karon Foster R.N. BScN, MEd.